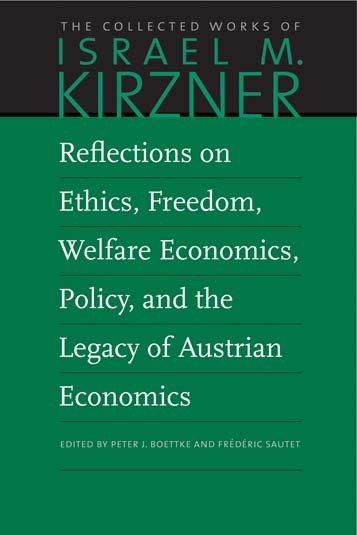 Reflections on Ethics, Freedom, Welfare Economics, Policy, and the Legacy of Austrian Economics comprises a variety of Kirzner’s essays on social thought. Kirzner’s intellectual interest and theories go beyond market process and entrepreneurship: they encompass several important topics that are vital to the existence of human societies. The tools that Kirzner developed in his work can be applied to many areas of inquiry. From the impact of governmental regulation on the entrepreneurial discovery process to the role of institutions in sustaining prosperity, Kirzner’s work shows that the free market is a necessary element in maintaining social harmony and bringing stability to our constantly changing world. Frédéric Sautet is Associate Professor at The Catholic University of America, Tim Busch School of Business and Economics. He is a specialist in Austrian market process theory and teaches entrepreneurship studies. He is the author of An Entrepreneurial Theory of the Firm and has published widely on entrepreneurship. Introduction to the Liberty Fund edition, three interviews with Kirzner, index.